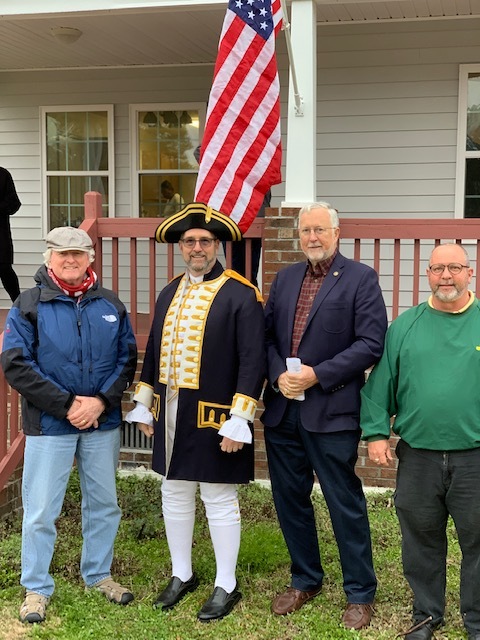 Compatriots of the New Bern Chapter of the NC Sons of the American Revolution participated in the Habitat for Humanity Home Dedication on Sunday afternoon, January 27, at 822 Howard Street in New Bern. Chapter Flag Chairman Lee Purcell and Chapter President Jay DeLoach performed a flag raising ceremony followed by the Pledge of Allegiance. Lee Purcell then presented the Williams Family with a copy of the U.S. Constitution. This is the third home dedication in the past year in which the New Bern Chapter has presented an American flag to the new home owners. Pictured from left to right are: Bob Ainsley, Jay DeLoach, Lee Purcell, and Alden Hobbs.